Last week, I shared a story with you about how some kids are getting in trouble for setting up lemonade stands, because technically you can’t do that without a vendor license, and those are way too expensive for kids to have. Some kids in other states were getting visits from police and then shut down, but thankfully those things weren’t here in Findlay. 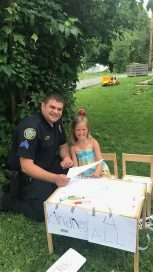 Here in Findlay, a Police Officer did, in fact, visit a little girl’s stand, but for a much better reason. 5-year-old Veda Wells wanted to set up an orange juice stand in her yard to help people cool off the other day when it was 700 degrees out. So, she got out a little table, a couple of chairs, and was all set, except she didn’t have any cups. Now, I don’t know if you’ve ever tried to battle the will of a 5-year-old, but I have, and I’m here to tell you that you can’t win. Veda was going to have her stand, and she wasn’t going to let a little thing like not having cups set her back. So, since the whole point was to make people smile, rather than move beverages, she sat down with some markers and some paper and started drawing pictures. She wrote “Kindness 4 All” on the paper and taped it to the front of the table. Instead of an orange juice stand, she created a kindness stand. She and her 18-month-old brother, Bodhi, drew and drew and drew pictures, and handed them out to strangers who were passing by. Here are these two little kids running a kindness stand over on Findlay Street off West Main Cross, and Findlay Police Officer Welch passed by. Turns out, you don’t need a vendor’s license to hand out kindness, and after a couple of really hot days and all that comes with being a Police Officer, Welch decided he could use a little dose of it himself. So, he bellied up. He had a chat with Veda and Bodhi, and they made him a picture, which he said brought him so much joy that he has it posted on his desk so he can get a smile on days when they’re hard to come by. Listen, it’s not easy out there for anybody. But with people like Officer Welch, Veda Wells, and Bodhi Johnson, their mom Haley and grandma Mitzi, it’s a little easier, isn’t it? 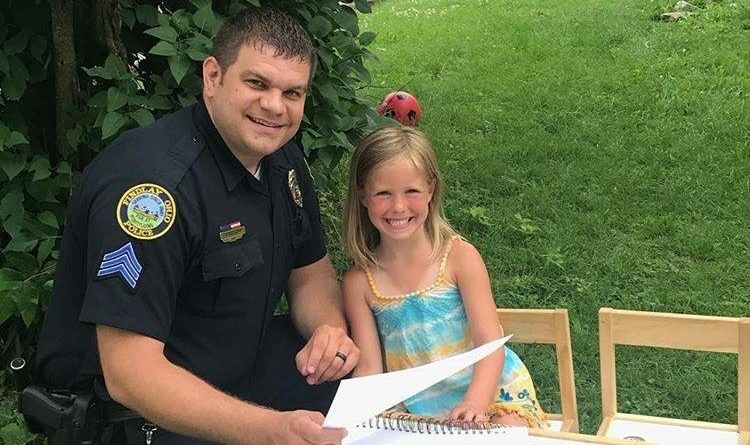 Isn’t your day better knowing that there’s a 5-year-old girl showing her little brother about kindness, and a Findlay Police Officer sharing in it? Mine is, and I hope yours is too. By the way, Mitzi tells me that the kids will open their kindness stand AND an orange juice stand again this summer, if you find yourself on Findlay street, keep an eye out and get some while you can because it doesn’t last long.